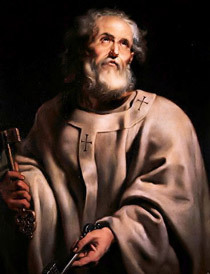 The Second Epistle of Peter is traditionally ascribed to Saint Peter, but in modern times widely regarded as pseudonymous. According to the epistle itself, it was written by the apostle Peter, an eyewitness to Jesus' ministry. He criticizes "false teachers" who distort the authentic, apostolic tradition, and predicts judgment for them. He explains that God has delayed the Second Coming so that more people will have the chance to reject evil and find salvation. He calls on Christians to wait patiently for the parousia and to study scripture. The dating of this epistle has proved very difficult. Commentaries and reference books have placed 2 Peter in almost every decade from 60 to 160 AD. The letter opens by identifying the author as “Simon Peter, a servant and an apostle of Jesus Christ” (2Peter 1:1). Elsewhere, the author clearly presents himself as the Apostle Peter, stating that the Lord revealed to him the approach of his own death (2Peter 1:14), that he was an eyewitness of the Transfiguration (2Peter 1:16-18), that he had previously written another epistle to the same audience (2Peter 3:1; cf. 1 Peter), and he called Paul the Apostle “our beloved brother” (2Peter 3:15). Although 2 Peter internally purports to be a work of the apostle, most biblical scholars have concluded that Peter is not the author, and instead consider the epistle pseudepigraphical. Reasons for this include its linguistic differences from 1 Peter, its apparent use of Jude, possible allusions to second-century gnosticism, encouragement in the wake of a delayed parousia, and weak external support. In addition, specific passages offer further clues in support of pseudepigraphy, namely the author's assumption that his audience is familiar with multiple Pauline epistles (2Peter 3:15-16), his implication that the Apostlic generation has passed (2Peter 3:4), and his differentiation between himself and "the apostles of the Lord and Savior" (2Peter 3:2). This epistle presciently declares that it is written shortly before the apostle's death (1:14). Arguments have been made both for and against this being part of the original text, but this debate largely is centered on the acceptance or rejection of supernatural intervention in the life of the writer. The epistle contains eleven references to the Old Testament. In 3:15, 16 a reference is made to one of Paul's epistles, which some have identified as 1 Thessalonians 4:13-5:11. The book also shares a number of shared passages with the Epistle of Jude, e.g. 1:5 with Jude 3; 1:12 with Jude 5; 3:2f with Jude 17f; 3:14 with Jude 24; and 3:18 with Jude 25. Tartarus is mentioned in 2:4 as devoted to the holding of certain fallen angels. It is elaborated on in Jude 6. Jude 6 however, is a clear reference to the Book of Enoch.